Click to Listen on Tunein! 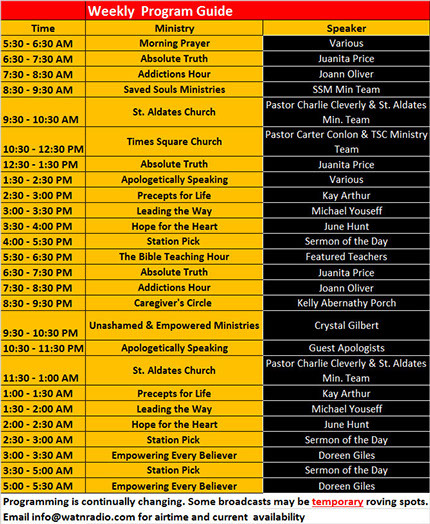 Welcome to WATN radio.com, The Absolute Truth Christian Talk Radio Network, bringing you 24-hour, life- changing, thought provoking messages 7 days a week, 24 hours a day. For information select Contact Us. Our mission is to provide Christian teachings and discussions that promote quality Christian living, discipleship, bible literacy and evangelism. Christian Counseling New Christian-based counseling for those who are experiencing a short or long-term challenge or struggle.